Collaboration in its truest form is defined by two or more artists coalescing their strengths and crafts into one cohesive piece of music, rather than simply combining the two and hoping for something comprehensible to emerge from the creative deluge. Prolific bands like Boris have worked on records with Sunn O))) (Altar) and Ian Astbury (BXI), each distinctly different from the respective components’ output but still maintaining scents of their original work at the same time. Iron Lung are another band that truly mastered this craft, especially with their Public Humiliation record, working with Walls and Pig Heart Transplant to create a harrowing torrent of noise and power violence. This brings us to St. Louis, Missouri, the home city of The Lion’s Daughter and Indian Blanket, two bands whose music is worlds apart yet here they are together in the form of A Black Sea. The Lion’s Daughter made their presence felt last year with Shame on Us All, their first full-length, a melee of visceral sludge imbued black metal, a la Wolvhammer, that raced through fiery blastbeats and caustic vocals with a punky flair. Indian Blanket on the other hand are versed in sullen and solemn folk music, guided by melancholy vocals and acoustic guitars complemented by verdant violin arrangements. 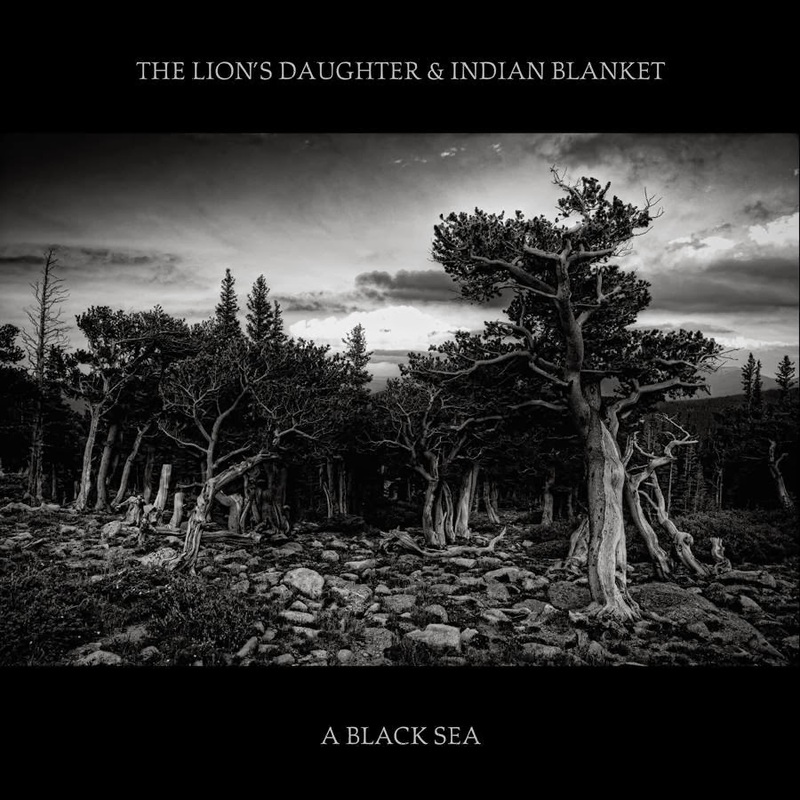 On A Black Sea, The Lion’s Daughter have reined in their tempo, broadly speaking, traversing a more doom-oriented plain all the while Indian Blanket lead the album’s sombre melodies with acoustic guitars, genteel and sombre vocals and utterly gorgeous violins. The album’s opener ‘Wolves’ presents the pairing’s modus operandi in evocative fashion as pastoral acoustic verses, helmed by serene clean vocals, bloom into trudging swathes of sludge-laden doom metal riffs glossed with dramatic violins and bellowing vocals from The Lion’s Daughter’s Rick Giordano, soon accompanied by heartstring yanking vocal harmonies that conjure up one compelling sound. This bleeding heart emotion is easy to dissect from the album’s more visceral sides with lush melodies poking through the grooving riffs of ‘Gods Much More Terrible’, and ‘Swann’ delving into an emotively rich trough only to scale to a stunningly poignant crescendo. ‘Song for the Devil’ plucks notions from the darkest of country, laden with morose acoustic guitars and solemn vocals meanwhile ‘Sea of Trees’ is the closest thing to black metal on this record with scorching tremolo guitars and utterly violent vocals. It’s the closest thing on this record that could be mistaken for simply being a track from The Lion’s Daughter. It somehow leads us into ‘That Place’, the album closer. More gloomy acoustic passages helm the path before guitars come crushing in again but maintains the melodic tones with clean vocals from Indian Blanket’s Joe Andert who regales tails of regret in a swelling chorus, sounding like a gloomier take on modern-day Anathema. A Black Seais compelling in its melancholy, marrying two diverse entities into one while showing no creases or folds, rather flowing naturally and seamlessly into each other; in many regards it’s an unexpected triumph but still wholly welcomed.